Athena: My wife's laptop. In Greek mythology, she was the goddess of wisdom and philosophy. My wife has been nothing but wisdom in our marriage, and I figured the name was very fitting. The laptop is an Apple iBook G4, thus entirely white. Greek gods and goddesses are typically depicted wearing white robes. When traveling with me to work, she is renamed to "athena2" as a computer on the network already exists with that hostname. She is running Mac OS X Tiger. 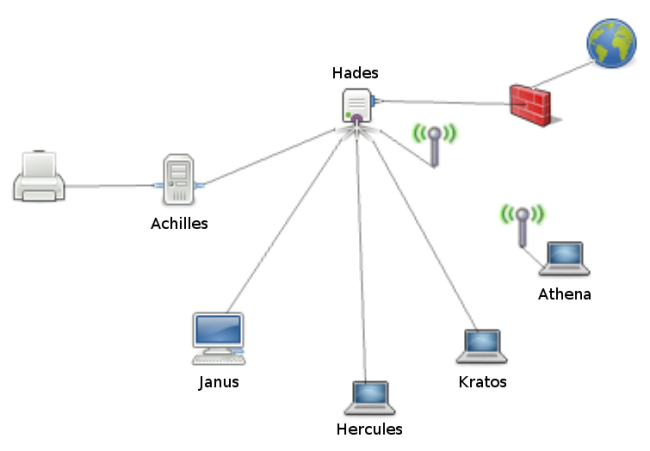 Hades: The NAT firewall and 4-port wireless router. I chose the name Hades initially, as he is the Greek god of the underworld. In modern times, we usually refer to Hades as a place, rather that the god, meaning hell. Because of the firewall, I thought it appropriate to name it Hades representing the lake of fire and brimstone. After naming the router, I found it fun to thrust these great Greek gods into hell for my amusement. It has stuck since. The router is a Linksys WRT54G running OpenWRT firmware. Hercules: My faithful laptop. He goes wherever I go doing what I need done. In Greek mythology, he was the son of Zeus, and the greatest of the Greek heroes. He was the strongest hardware that I had at the time of his purchase. I chose the Roman equivalent, rather than the Greek spelling Heracles, as it is a laptop with modified HP hardware. He has since had hardware problems, and will serve me as my IRC and database server, as well as a backup for Achilles. He is currently running Ubuntu Feisty Fawn 7.04, although, he will become the second Ubuntu Dapper Drake 6.06.1 LTS in hell. Janus: This is my desktop. In Roman mythology, Janus was a god with two heads. He was the god of gates, doorways, beginnings and endings. Because my desktop dual-boots between Windows XP (for my wife) and Ubuntu Feisty Fawn 7.04, I found the Roman god to be fitting. Other than the dual nature of the desktop, not much is shared with the character of Janus (maybe my wife will "end" her Windows XP need, and "begin" with Ubuntu in her computing (that's stretching it)). Kratos: My new laptop (arriving Monday). I chose Kratos for a two-fold reason. First, Kratos was one of the Titans, son of Styx and Pallas. He is the god of strength and power. This new laptop (I chose the T61), is loaded with top-of-the-line hardware, full of processing power, and plenty of RAM. Kratos later became the right hand man of Zeus, doing Zeus' bidding in exact obedience. This laptop will do my every bidding going wherever I go. His main operating system is still undetermined at this point. Below is an image depicting the network. Now tell me, does anyone else go to these lengths when naming their boxes? I would be curious of other naming schemes if they exist. Posted by Aaron Toponce on Sunday, August 19, 2007, at 11:01 am. Filed under Ubuntu. Follow any responses to this post with its comments RSS feed. You can post a comment or trackback from your blog. For IM, Email or Microblogs, here is the Shortlink. Awesome -- I name my notebook Hephaestus, the ultimate Greek geek. I name mine after D&D 3.5 classes. Nice diagram! What did you use to create it? I find myself running Microsoft Visio inside a virtual machine, and I really rather be using something open-source..
We went with a dragon theme here at out house. We took them from several different mythologies and some fiction. Any advice on setting up an old eMachine with Ubuntu 7.04 for a server? Let us know how new ThinkPad works with Ubuntu- I have an old X-20 and a newer T-42 that I am ready to convert over to Ubuntu. I name my machines after important computer people - Dennis, Ken, Brian and Joy are my current machines. I pick the names more or less randomly from a list. I was naming all the computers on my network after characters and objects in Homestar Runner. So far we've got Strongbad, Marzipan, Rectangle (Yes, it's a laptop), and PomPom. Breaking from the theme is my personal laptop. It was going to get some great name like "Gizmo", "Widget", or "Wombat", but then I found out that my university's ResNet requires a boring FirstLast naming scheme. I'm also curious to know what program you used to generate the network layout diagram. I've been looking for years for a decent open source alternative to Visio and always came up short. And while you're at it let us know how Linux behaves on the T61. Like you I'm also wavering between a Macbook and a Thinkpad next time I upgrade. As for the naming scheme I use at home, I draw the names from the islands of Earthsea. I'm using stars as names. For instance this machine is Arcturus. My laptop bears the name of Ross154. The girlfriends laptop is Cassiopeia and so on. I usually go with Middle Earth names. Small networks get names from the fellowship. Slightly bigger ones get dwarf names from the hobbit. Daedalus and Icarus, my ancient desktop and newer laptop respectively. Both running feisty. Hermod; my phone. Cerberus; my router. Networked laser printer is 'Homer'. Three more desktops were Socrates, Plato and Aristotle. Great post. For me it's Aliens characters. Ellen, Newt, Hicks, Hudson, etc. oops. Cerberus is my ps3. Hades is my router. @Samat Jain and Bogomips- I used Gimp to draw the diagram, however, Dia is a *great* alternative to Visio. aptitude install dia. @Adam- Definitely a true nerd. @Mike- It all depends on what you want to do with it. @Erik- Using stars is an interesting idea. Haven't heard of that one before. @Luke- Yeah. Middle Earth seems to be very popular with networks. My Laptops have historically gotten 'cat' names, desktops have gotten 'human' or 'character' names. Of late my laptops have gotten names related to their manufacturer. Every device does get a name, and I'm running a dns server that I update with those devices IP and name relationships. My boxes don't have any uniform naming scheme. My desktop is "dylan" after the musician, my laptop "zoidberg" after the Futurama character, mythtv box is the Sanskrit word "navras" (Wikipedia/Google for its significance", and my WRT54GL is "valkyrie" after the Norse dieties. when you want do draw high quality network diagrams, you better use inkscape or even gimp. I choose important figures of the Age of Enlightenment, being Diderot, Montesquieu, Voltaire and Liebniz picked up at the moment. I use characters and placenames from the Melanie Rawn series of books, Dragon Token. So they are rohan, sioned, skybowl, cunaxa, faradhi, kazander, azhrei, azhdeen, and others. I use Dia and/or OOo for drawings; both have their pros and cons. I currently have 8 hard-wired ports in the house (5 downstairs, 3 upstairs) and no ports in my office so just a lot of cables running across the floor behind furniture (this was on purpose). I have a total of four routers, two of them are reflashed WRT54GL's and the others are D-Link and Netgear. My office is on a gigabit switch, while the other ports in the house are 10/100. My network has 5 subnets on 3 VLANs with two enabled wireless APs, one acting as a hotspot (when guests need connectivity) and one for private use by my wife and me. The network-attached print server and the TiVo Series2 are not particularly well-protected at the moment. I name my gadgets after Veggie Tales characters. I name my boxes after Star Wars systems and planets, which means I currently have alderaan, kashyyyk and yavin. (I keep them lowercase). I'm using female character names from Star Trek series and some of my computers are named some star names. I'm amused by all the comments thus far. The urge to share your computer naming conventions is wonderful. While I wouldn't divulge so openly, it's intriguing to view your diagram. This brings me to echo a further call of how you did this. Was it an open source tool? inkscape? dia? other? Please share! Also some VMs like Intrepid, Defiant and so on. where can I find these icons? I don't have such a nice graph - just listed my machines, even if it is not completely up to date. I named them after characters from Ragnarök (Korean manga), Workstations / Notebooks = female, servers = current name of "gods", rest = old name of "gods"
At work we use the classic Simpson names. I've seen screenshots of someone using characters from Arrested Development which I think is awesome. I've been using the character names from Scrubs since many are small (jd, turk, eliot, cox, tod, ted, etc). @Derek Buranen- What should I be worried about? Even if I published the IP addresses, this doesn't give you any information that a cracker who entered the network couldn't easily get. By the way, I used the Gimp for the diagram. @Markus- I took them from a Gnome icon toolset found on art.gnome.org. The firewall icon, I Googled. What about unique pies? We named ours things like rhubarb, mud, cottage etc. They even relate (somewhat) to their names. Cottage - printer; mud - firewall. I use characters names From the Belgariad and he Mallorean, from David Eddings. My desktop's name is Silk, my main server Ul, etc. Apart from one old laptop named "giger" (black and gnarly), I've stuck with scientists: feynman, newton, kelvin. Oh, and my old ipaq running Familiar? The temperamental but invaluable "ziggy". I claim my geek points now! I used to use Muppets, but I've moved onto chefs (Alton, Giada, etc). And because I use a lot of external hard drives, I label those after spices (cumin, coriander, etc). I currently use the latin words for the Seven Deadly Sins. I don't have many computers so this suits me fine. My desktop is superbia/pride (but changes to gula/gluttony if I boot it up under windows). My ancient laptop - and I really do mean ancient; it's a Thinkpad 390 with a dead battery - is acedia/sloth. Haha, I'm so boring. I just have 2 computers right now, and they're named djb-laptop and djb-desktop. My laptop is a 2003 desktop replacement model--Pentium 4 2.4 GHz and 512 MB RAM, upgraded hard drive and wifi (it was a free gift last Christmas--I really lucked out with this thing), and my desktop is an old Pentium II 333 MHz computer with 160 MB RAM and 40 GB hard drive. Oh, and I use Kubuntu Feisty on both computers, since KDE runs beautifully on both of them. I have started using the character names from StarGate and StarGate Atlantis. @Amy Rose- KDE runs that well on that old of hardware?? I would think that you would be running Xfce or fvwm to take advantage of resources. My network naming scheme is based on the Bulbous Bouffant skit from the Vestibules. My network is bouffant, my computers are eskimo, gazebo, and mukluk. I name my whole network (I run a carrier) based on greek mythology. It seems the ancient greek naming scheme is quite common. I mostly went with it because my name is Jason. I call my old desktop Zeus, my new one Hercules (due to an ignorance of the proper spelling). My vaio laptop is called Poseidon and my macbook pro is called Odysseus. In a research lab where I once worked, they used a naming scheme based on wines. The diagram looks like very beautiful. I need add only a fax in my home network diagram. Why not name the router Charon, since he ferried souls across the river Styx into Hades / hell / the underworld / etc? I believe it makes a nice metaphor for port forwarding.